Hubby and I frequently host a game night at our house. We joined a Meetup game group when we were in Hawaii and fell in love with the comraderie and the games. We were hoping to start one when we moved to Pensacola, so imagine our happiness when we found out there already was one here! It's always a little nerve wracking when you first decide to meet with a new group, but in general people who play games are pretty awesome and welcoming. After going for a couple of months the people who had been hosting had a baby so Hubby and I decided to take over hosting responsibilities. We love it because it means that we get to play games and meet new people. Also, we bought our house specifically to host events like game night. 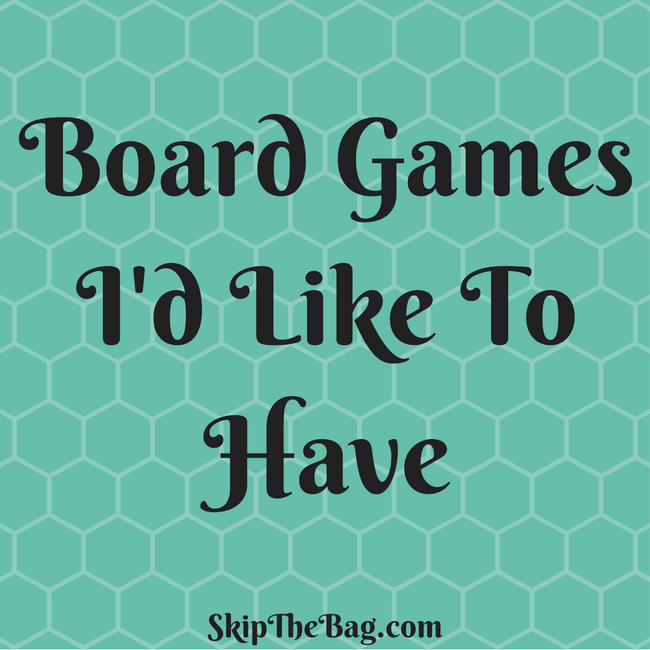 So what are some board games that are on my list to get? It's the late 1990s where France has a lot of unexploded ordinance and Britian has cows with Mad Cow Disease. You are trying to explode the cows in your field to earn money. I haven't played this game, but Hubby specifically came up to me to request it for Christmas. Both people who talked about how to play mentioned the chaos of it, but it sounds like you play out actions knowing roughly what other people are doing, but there are some secret cards that make it turn out far differently than you had planned. I haven't played this game in over a year, but it's been on my list to buy since then. You try to harvest and sell resources. This is a good group game. There are two code masters who try to relate words together to get their team to guess their words but not the others. The trick? You can only say one word and one number! How do you make them say yard and cup but not park? Try "measurement, 2" It makes you think, and sometimes you are surprised the rabbit holes your teammates will go down. So whether you play games to be more social or are doing it for a frugal way hang out, I would recommmend at least checking these games out! *This is an affiliate link. See my privacy and disclosure statement. We're big into games here too. We've got Munchin Panic (which is a version of Castle Panic), Forbidden Island, and One Night Ultimate Vampire - along with a few other more basic favorites (Rumikub, Apples to Apples, and Trivia Pursuit). I also bought the new Labyrinth game (based on the 80s movie), but we haven't made it through a whole game yet. Some friends of ours also have one called "We haven't play-tested this game" or something like that. It's basically cards, but a pretty fun and generally quick-to-play game. I haven't heard of any of those. I'll have to check them out. We always love new games! Thanks for sharing. Big board game players here - Settlers of Catan is our new favourite along with Ticket to Ride and Caracssonne. We have all of those! Hubby actually has started making wooden versions of Settlers of Catan, they are so beautiful.